« I felt in in love with the man himself, while he adored my gunshot.” In a letter to art critic Li Xianting in 2003, the artist Xiao Lu broke her silence for the first time, admitting her failed love affair with artist Tang Song, and claiming the sole right to say she was the one who fired the pistol in 1989 into her and Tang’s installation called “Dialogue,” the sensational and historic event that temporarily shut down the famed China/Avant-Garde exhibition at the National Gallery in Beijing. As history constantly gets redefined over the course of time, the two gunshots that led to the closure of the grand exhibition 17 years ago are now being reinterpreted as a personal action without any motive, and as the beginning of a sad love story. The long-forgotten incident has also escaped from the political shadow in an exploding art market. Today, however, Xiao Lu’s original installation just sold at the China Guardian Auction in Beijing for over $200,000. The National Gallery exhibition occurred at a time when the art market was exploding with excitement. But now, looking back on the China/Avante-Garde exhibition, one cannot help sighing at the dreams and passions of those early years. After the vigorous 1985 New Wave Art movement, the prairie fire force of modern art that originated in the Stars group art exhibitions of 1979 and 1980 had lost their edge under the impact of social and economic reforms. The ‘Grand Modern Art Exhibition of China’ carried out in 1989 served actually as the last inspection show for Chinese avant-garde art in the 1980s. In her book, “Going Beyond the Limits: Chinese Avant-garde Art from 1979 to 2004,” Lu Hong recounted that the idea of a ‘national modern art exhibition’ was actually first conceived in 1986 at the “Grand Slide Show and Symposium on 1985 Trends of Young Artists” jointly conducted by Zhuhai Art Academy and China Fine Arts Daily. The art critic Gao Minglu organized the first exhibition-planning meeting in March of 1987, but the application for an exhibition stopped half way through the process because of the nation-wide campaign against the ‘bourgeois liberation.’ Not until October of 1988 did the preparatory committee for ‘Modern Art Exhibition of China’ come into being, and seven institutions including Fine Arts magazine, China Fine Arts Daily, were decided on as the sponsors to collect art works nationally, and to hold ‘Modern Art Exhibition of China’ at National Gallery of China in February of 1989, which was entitled “No U-Turn”. Art critic Yin Shuangxi, then editor of Fine Arts magazine, who was involved in the preparatory work, still remembers that event vividly. “My job was similar to that of an ‘office director,’ responsible for the specifics in organization and coordination. Then an office for exhibition was set up in the small red building where the Youth League Committee and the Students Union of the Fine Arts College were located. The job division went like this: Gao Minglu and Li Xianting were chief members of responsibility for the exhibition. Gao was in charge of the whole affair; Li was responsible for designing the layout of the exhibition hall; Fei Dawei dealt with foreign contacts; and Hou Hanru assumed the printing of exhibition handouts. The other critics involved were Fan Di’an, Tang Qingnian, Wang Mingxian, Zhou Yan and Kong Chang’an. Strict examinations of the works had to be made before the show opened. 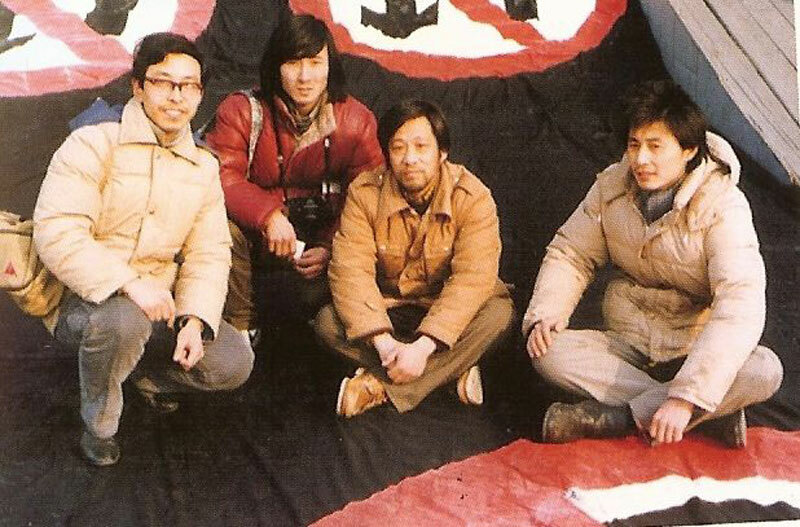 On the eve of the exhibition, in February 1989, Gao Minglu says officials from the National Gallery and the Art Bureau of the Ministry of Culture were still meeting with the organizing committee, questioning and criticizing some of the exhibits. 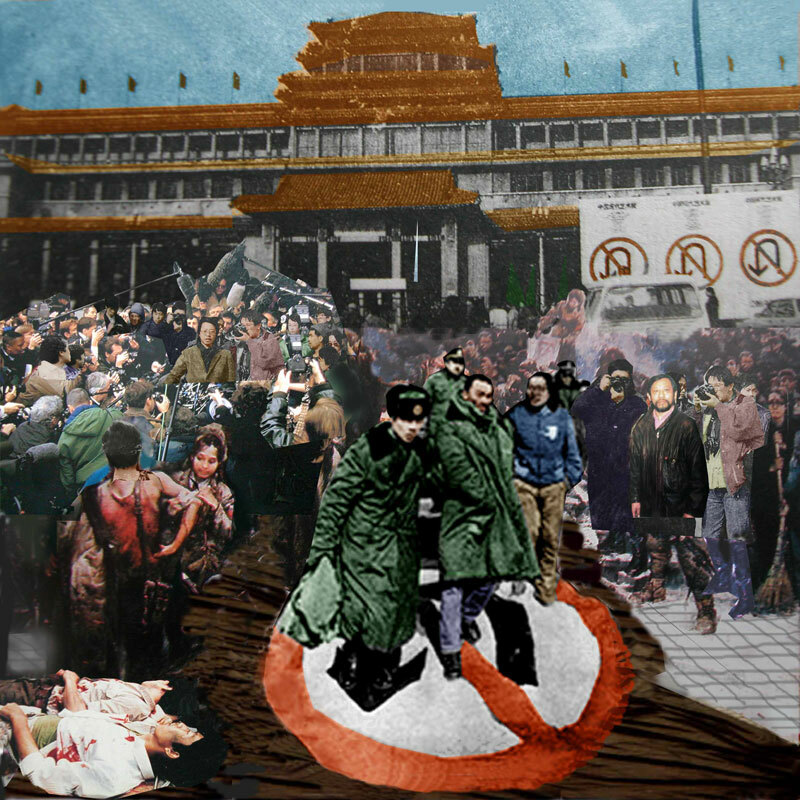 “Mao Zedong AO,” a provocative painting by Wang Guangyi, received the most attention, and it was barred from being shown until the artist supplied a written statement promising that his work was a rational analysis of the late Chairman. In February 5, 1989,‘China/Avante-Garde” exhibition at the National Gallery opened after three months of intense preparation. It was the eve of Chinese New Year. 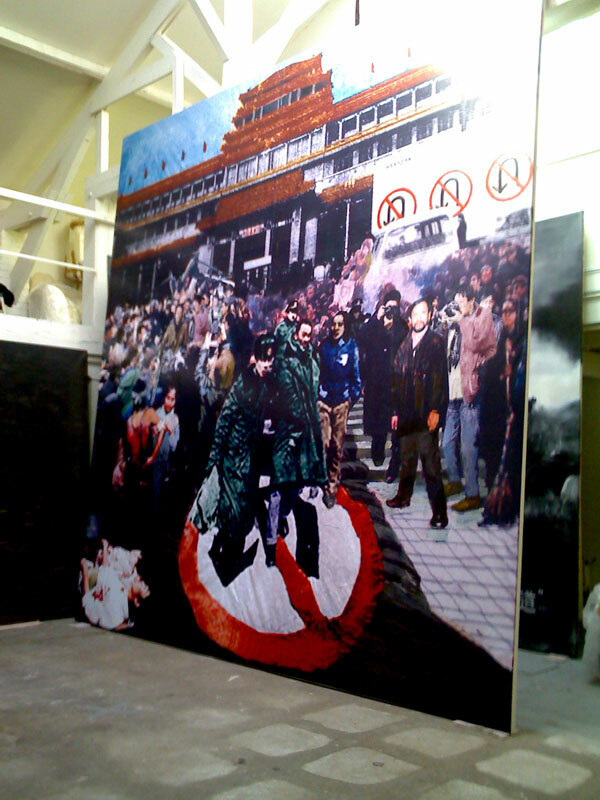 The logo of the exhibition consisted of three massive posters printed with the ‘No U-Turn’ traffic symbol hanging in front of the entrance to the Gallery. Also, the carpets leading into the Gallery were colored black and all printed with that “No U Turn” symbol. In an after interview, Huang Zhuan said it represented the wish of artists that China’s reforms should go on forward, and not turn around or go backwards. At 9 AM that morning, exhibition planner Gao Minglu announced at the opening ceremony that “the first grand modern art exhibition of China organized by Chinese artists themselves is now open.” About 186 artists from around the country, including artists from Tibet and Inner Mongolia, exhibited 297 pieces of artwork in six exhibition halls on all three floors of the National Gallery. The avant-garde artists’ collective show included sections like, ‘exotic arts’ such as performance, installation, political pop art, rational painting and experimental wash and ink. Many of the works were provocative and dramatically different from the traditional aesthetics of realism, Cultural Revolutionary art or traditional ink and wash painting. Visitors swarming in through the eastern hall entrance on the first floor would suddenly feel the psychological impingement from the installation “Mass of Midnight,” by Gao brothers. Against the black and red background, a huge Cross formed with over a hundred condoms dilated with air, floating in the air; a massive air-filled object of strong sexual implication was hanging down from the ceiling; and there were also air-filled medical gloves tied in a bundle on the floor. The huge painting “All were Sinners before Our Arrival” by Qu Yuan was displayed in the middle hall on the second floor, above which hung Xu Bing’s “A Book from the Sky” installation. On the same floor were paintings by Wang Guangyi, Ding Fang, Ye Yongqing, Mao Xuhui, Liu Xiaodong, Fang Lijun and Geng Jianyi. Performance artist Zhang Nian, whose works failed to pass the examination, began to practice the performance art ‘floating egg’ on the second floor immediately after the opening ceremony. In the pictorial memorabilia, Zhang Nian sat on the floor with crossed legs; around him was a scattered straw mat and eggs; on his chest he attached a piece of white paper with the writing, “No theoretical debate during my floating egg performance, lest it troubles the next generation.” Two young visitors drew near him, as if asking about the significance of such absurd performance works, Zhang recalls. Singled out for display on the third floor were works of ‘pure art language’ categories, which featured abstract painting and experimental wash and ink painting. The installation work “√” by Wang Youshen and Yang Jun, in contrast, impressed deeply. The artists pasted the 2X8 meter wooden board full with human photos shot in the Wangfujing Boulevard, then stuck in its middle a court ordered death notice with a large red ‘√’. Demanded by organizers after the opening, the ‘√’ symbol was covered, and the words in the notice were also sealed up with glue paper. Wang had recorded the visitors’ reactions to the work with a video camera. Performance art was first demonstrated to Chinese visitors during the 1989 “No U Turn” exhibition. Wu Shanzhuan was selling prawns on the spot, and was prohibited after questioning by police; Li Shan, in red clothes and trousers, was washing his feet in a basin filled with images of a person’s head. Like the ‘floating egg’ artist Zhang Nian, Wang Deren also failed to bring his works through the examination, but he managed to carry out his performance art by ‘throwing condoms into the air’ on the scene. The numerous exotic scenes staged at the exhibition shocked all the visitors and news media; its sensational effect soon reached across the Pacific Ocean. A review article about that exhibition appearing in Time magazine of the same year was directly titled “Eggs, Gunshots, and Condoms”. Xiao Lu’s shooting at her installation “Dialogue” was undoubtedly the most eye-catching incident among the kaleidoscopic performance arts. Demonstrated by a part of the video shot by Wenplin, around 11 a.m. on February 5, Xiao stood in front of her “Dialogue” installation, which was created out of two phone booths, and then she fired a revolver at it. In the crowd came a shout “Give it another shot!” by Tang Song. Then Xiao shot another bullet, which together with the first one left two holes of moderate size in the glass booth. The gunshot plot was beyond all planners, artists and visitors except Xiao and Tang. Chaos ensued in the Gallery, and it was only two hours after the opening. The police arrived in force at the news, and arrested Tang as the gun shooter, while Xiao reported herself to the police at 5 PM in the afternoon. The exhibition was closed at 3 PM that afternoon, and the Gallery announced a 5-day closure in the name of the Spring Festival. The ‘gunshot’ incident soon made its way to various key foreign news media; many domestic ones, including People’s Daily, also followed the event. And two different voices rose from exhibition planners: one, representing most critics, favored clarification of the irrelevance of the incident to the sponsors and condemnation of the gunshot action, another, representing Li Xianting and some of the artists, persisted in a jointly-signed letter of appeal for release of Xiao and Tang. The exhibition was resumed five days later, but another farce under the name of ‘performance art’ soon came to the fore. On February 14, Beijing Daily, Beijing Municipal Public Security Bureau and National Gallery of China received simultaneously anonymous letters, threatening to set an explosive device in the exhibition hall if that exhibition were not closed immediately. The exhibition was forced to close again for two days. The implementer of such a ‘performance art’ threat remains till today a mystery in modern art history. On February 17, the exhibition reopened, and it closed as scheduled two days later. The 1989 China/Avante-Garde exhibition was the first and only time when avant-garde artists appeared as a large group at the National Gallery, the country’s most important arts venue. 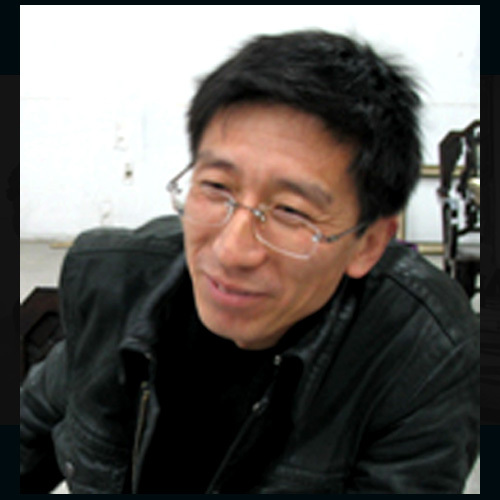 After the exhibition, helped by art critic Gao Minglu, Song Wei, an individual businessman in Beijing who had contributed part of the fund for the exhibition, bought the works of over a dozen artists including Wang Guangyi, Zhang Xiaogang, Ye Yongqing, Ding Fang, Mao Xuhui and Zhang Peili, at a price of 10,000 renminbi, or about $1,200 a piece. Mr. Song, who later set up one of the country’s first private art galleries, has since disappeared and it is unclear whether the works he acquired survived. Also, many of the artists who appeared in the show later returned to their work units.Due to apparent lack of business sense for art by either artists or exhibition planners, most of the exhibited works not claimed at the end of the show disappeared in the following years, and are now lost to history. Recently, however, more than 16 years after the exhibition closed, some of the works that were believed to have been lost have appeared unexpectedly in the auction market, particularly at the China Guardian Auctions this year, creating a sensation. The National Gallery exhibition works sold for a total of about $130,000 in the spring, and then perhaps as much as $700,000 in the recent auction, this November. To reclaim the copyright to his work “Philosophical Manuscripts,” the artist Liu Xiangdong sued the auction company in court, making the 1989 grand modern art exhibition again the focus of public opinion.